Welcome to the Mishawaka’s shuttle and on site parking reservation system. The shuttle service is provided to offer a stress-free, green way to safely get to and from the Mish. The link at the bottom of this page will allow you to reserve and pay for a spot on the shuttle ride of your choosing. Shuttle fare is $24 (reservations available online only) and will include the ride back down the canyon. Standby passengers must bring $25 cash (exact change only please). We DO NOT recommend parking at the venue due to incredibly limited space and in order to discourage parking on site, the cost to park is $40 per car. Use the link at the bottom of this information page to get started. Please take care to double check the correct date for your show when booking your shuttle reservation. Parking/Shuttle is not listed for sale online… This means that particular option is sold out. Reserved shuttle riders receive priority seating. Stand-by purchase available but seating not guaranteed. To ride standby please bring $25 cash to the Colorado State University Transit Center. To reserve a seat, please do so at least 26 hours in advance of show. If parking (and/or shuttles) are sold out, there is often standby room on the shuttles. Some patrons often meet at the shuttle stop to carpool. Unaffiliated transportation companies are listed at the bottom of our Shuttle and Parking info page: http://www.themishawaka.com/info/parking-and-transportation/. The Mishawaka cannot advise patrons to park in the canyon along the highway. There are NO Day of Show changes, edits, or cancellations to any shuttle or parking reservation. If you can’t find your shuttle/confirmation email, please email info@themishawaka.com or mishtranspo@gmail.com and we will resend. You do not need your confirmation receipt to claim your shuttle or parking reservation. You just need the reservation name (identification is preferred). To exit and get back on the shuttle at the END of the night, please join the line that exits through the restrooms. If you need assistance or want to change your reservation, please email mishtranspo@gmail.com. Refunds can only be requested 48hrs in advance of show doors. Please email mishtranspo@gmail.com to request. CSU is the only shuttle pickup. There is no campground or alternate transportation service offered by the Mishawaka.All shuttles are scheduled to return at the end of the show. Shuttles will be loading through the show and may leave early if they fill. We cannot switch the name of your reservation, however if they use your name, they will be able to use your spot. There is NO drinking OR smoking at the shuttle stop or on the buses. Please be respectful. Chairs are only permitted if space allows. Email mishtranspo@gmail.com to check before bringing your chair. An oversized vehicle is a vehicle that can hold 13-15 passengers, any trailer, RV or large capacity cargo van. Passenger trucks of all size are regular parking. To reserve handicap parking, please purchase a regular parking pass on the website, and email mishtranspo@gmail.com for a preferred handicap space next to the venue. We will respond to your message within 72 hours. You may receive Day of Show assistance by texting (970) 481-9466. Colorado State University Transit Center is located on the west side of the Student Center parking lot. Driving on College Ave, turn west onto Laurel. Then left on Meldrum. Parking here is free after 4 pm on weekdays, and free all day on weekends and holidays. Please note there is no smoking or drinking allowed at the shuttle stop. Please note: Standby passengers are NOT guaranteed a spot on a shuttle. To attempt to ride standby, bring $25 exact change to the shuttle stop. If you would like a guaranteed ticket, please reserve a seat online 26 hours in advance of the show. 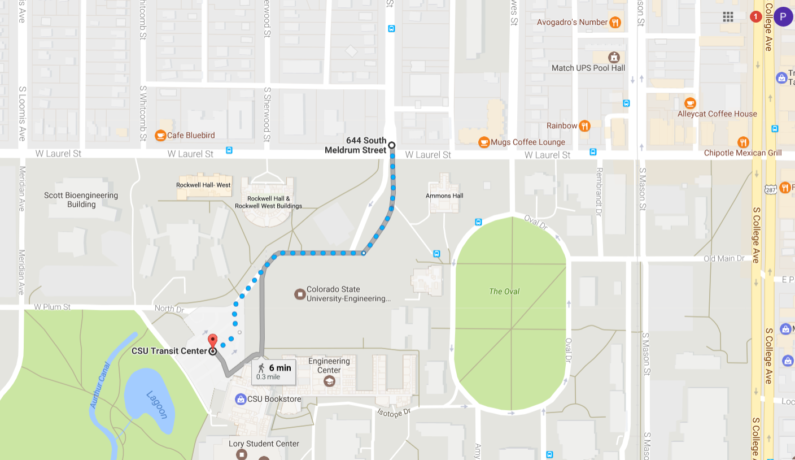 Directions: The parking lot for the CSU Transit Center is located on the south side of S Meldrum St and W Laurel Ave. Turn South to get into the parking lot. Do NOT follow google maps to CSU Transit Center, it will take you to the wrong location. The map below shows the ONLY route into the correct parking lot. We do offer parking at a price of $40 per spot. With only 60 spaces at the venue, parking on site is reserved for extreme need situations. Please remember there is no tailgating allowed at the Mishawaka. Don’t want to use our shuttle service? Mishawaka’s shuttle service sold out? No problem! We have compiled a list of local transportation companies, however we cannot reserve space from outside providers for you.